Step off the beaten path and head to Room Escape Games and Catedral Primada. Explore Madrid's surroundings by going to Mirador del Valle (in Toledo), The Walls of Avila (in Avila) and Segovia (Segovia Aqueduct & Alcazar de Segovia). And it doesn't end there: examine the collection at Prado National Museum, admire the masterpieces at Royal Palace of Madrid, take in the local highlights with Walking tours, and admire the striking features of Plaza Mayor. To find reviews, more things to do, photos, and other tourist information, refer to the Madrid vacation maker website . Belo Horizonte, Brazil to Madrid is an approximately 15.5-hour combination of bus and flight. Traveling from Belo Horizonte to Madrid, you'll lose 4 hours due to the time zone difference. Traveling from Belo Horizonte in October, expect Madrid to be little chillier, temps between 26°C and 13°C. Finish your sightseeing early on the 9th (Wed) so you can take a train to Barcelona. Eschew the tourist crowds and head to Magic Fountain (Font Magica) and Room Escape Games. Explore Barcelona's surroundings by going to Kayaking & Canoeing (in Lloret de Mar) and Monumento a La Sardana (in Lleida). And it doesn't end there: take in the architecture and atmosphere at Basilica of the Sagrada Familia, admire the striking features of Basilica de Santa Maria del Mar, examine the collection at Carrer del Mirador del Palau Nacional, and contemplate the long history of Casa Batllo. To see where to stay, other places to visit, reviews, and tourist information, go to the Barcelona trip itinerary tool . You can take a train from Madrid to Barcelona in 3 hours. Alternatively, you can fly; or drive. Traveling from Madrid in October, plan for somewhat warmer nights in Barcelona, with lows around 18°C. Wrap up your sightseeing on the 13th (Sun) early enough to travel to Rome. Discover out-of-the-way places like Roman Forum and Duomo di Orvieto. Go for a jaunt from Rome to Civita di Bagnoregio to see Civita di Bagnoregio about 1h 45 min away. There's lots more to do: delve into the distant past at Colosseum, wander the streets of Trastevere, get to know the fascinating history of Piazza Navona, and don't miss a visit to Spanish Steps. To see where to stay, ratings, reviews, and more tourist information, you can read our Rome trip itinerary planner. Traveling by flight from Barcelona to Rome takes 5.5 hours. Alternatively, you can drive; or take a train. Traveling from Barcelona in October, plan for a bit cooler nights in Rome, with lows around 15°C. Finish your sightseeing early on the 18th (Fri) to allow enough time to travel to Sarajevo. Kick off your visit on the 19th (Sat): take in the architecture and atmosphere at Church of the Holy Archangels Michael and Gabriel in Sarajevo, examine the collection at War Childhood Museum, then contemplate the long history of Bascarsija, then don't miss a visit to Sarajevo Memorial for Children Killed during Siege, and finally contemplate in the serene atmosphere at Gazi Husrev-beg Mosque. Keep things going the next day: hike along Vrelo Bosne. To find reviews, photos, where to stay, and other tourist information, read Sarajevo trip itinerary planning app . Traveling by flight from Rome to Sarajevo takes 7.5 hours. Alternatively, you can do a combination of car and ferry; or do a combination of train, ferry, and bus. Prepare for slightly colder weather when traveling from Rome in October: high temperatures in Sarajevo hover around 20°C and lows are around 6°C. Finish your sightseeing early on the 20th (Sun) to allow enough time to travel to Zagreb. Kick off your visit on the 21st (Mon): awaken your taste buds at some of the top wineries in the area and then cross one thing off your bucket list with a skydiving experience. Get ready for a full day of sightseeing on the next day: take in the spiritual surroundings of St. Mark's Church (Crkva sv. Marka), indulge in some culinary diversions at a local gastronomic tour, then make a trip to King Tomislav Square (Tomislav trg), and finally test your problem-solving skills at popular escape rooms. To find maps, ratings, more things to do, and tourist information, refer to the Zagreb day trip app . Traveling by flight from Sarajevo to Zagreb takes 2.5 hours. Alternatively, you can do a combination of flight and shuttle; or drive. In October, daily temperatures in Zagreb can reach 19°C, while at night they dip to 8°C. Cap off your sightseeing on the 23rd (Wed) early enough to go by car to Budapest. On the 23rd (Wed), take in the views from Liberty Bridge (Szabadsag hid), get a sense of history and politics at Parliament, then head off the coast to Margaret Island, and finally see the interesting displays at Hospital in the Rock. On the next day, contemplate in the serene atmosphere at St. Stephen's Basilica (Szent Istvan Bazilika), pause for some photo ops at Hősök tere, pause for some photo ops at Shoes on the Danube Bank, then snap pictures at Szechenyi Chain Bridge, then take in the spiritual surroundings of Matthias Church, and finally make a trip to Fisherman's Bastion. For traveler tips, more things to do, and tourist information, go to the Budapest visit planning app . Traveling by car from Zagreb to Budapest takes 3.5 hours. Alternatively, you can take a bus; or fly. In October, daytime highs in Budapest are 19°C, while nighttime lows are 7°C. Finish up your sightseeing early on the 25th (Fri) so you can go by car to Bratislava. On the 25th (Fri), step into the grandiose world of Devin Castle (hrad), then make a trip to Slovak Philharmonic, then test your problem-solving skills at BrainTeaseLava - more than Escape Room, and finally take in the views from Stary most. On the 26th (Sat), you'll have a packed day of sightseeing: explore the historical opulence of Bratislava Castle, take a stroll through Bratislava Old Town, and then have some family-friendly fun at Mackafe (cat cafe). To see more things to do, reviews, ratings, and more tourist information, you can read our Bratislava itinerary planner. Traveling by car from Budapest to Bratislava takes 2 hours. Alternatively, you can take a train; or take a bus. In October, plan for daily highs up to 18°C, and evening lows to 8°C. Cap off your sightseeing on the 27th (Sun) early enough to go by car to Prague. Go for a jaunt from Prague to Kutna Hora to see Ossuary / The Cemetery Church about 1h 20 min away. There's lots more to do: wander the streets of Old Town Square, get great views at Prague Astronomical Clock, get the lay of the land with Walking tours, and take in the architecture and atmosphere at Kostel sv. Mikuláše. To find where to stay, traveler tips, more things to do, and more tourist information, read our Prague online visit planner . Drive from Bratislava to Prague in 3.5 hours. Alternatively, you can do a combination of bus and flight; or take a train. In October, plan for daily highs up to 15°C, and evening lows to 7°C. Wrap up your sightseeing on the 31st (Thu) early enough to drive to Berlin. When in Berlin, make a side trip to see Memorial and Museum Sachsenhausen in Oranienburg, approximately 46 minutes away. There's lots more to do: don't miss a visit to Reichstag Building, pause for some photo ops at Brandenburg Gate, test your problem-solving skills at popular escape rooms, and browse the exhibits of Kaiser Wilhelm Memorial Church. To find traveler tips, ratings, where to stay, and more tourist information, read Berlin trip maker website . You can drive from Prague to Berlin in 3.5 hours. Alternatively, you can fly; or take a train. Finish your sightseeing early on the 4th (Mon) to allow enough time to travel to Amsterdam. You'll explore the less-touristy side of things at Reptile House De Aarde and Zaanse Schans. Change things up with these side-trips from Amsterdam: Nieuwkoopse Plassen (in Nieuwkoop) and Rotterdam (Rotterdam Centraal Station & Erasmus Bridge). And it doesn't end there: explore the world behind art at Van Gogh Museum, take an in-depth tour of Anne Frank House, browse the collection at Central Library (Openbare Bibliotheek), and stroll through Vondelpark. To see photos, traveler tips, ratings, and more tourist information, read our Amsterdam day trip app . Traveling by flight from Berlin to Amsterdam takes 4.5 hours. Alternatively, you can do a combination of flight and train; or drive. Expect a daytime high around 12°C in November, and nighttime lows around 5°C. Finish your sightseeing early on the 8th (Fri) to allow enough time to travel to London. London is known for museums, nightlife, shopping, historic sites, and parks. Your plan includes some of its best attractions: step into the grandiose world of Buckingham Palace, admire the masterpieces at National Gallery, admire the striking features of Houses of Parliament, and get engrossed in the history at The British Museum. To find more things to do, where to stay, reviews, and tourist information, go to the London trip planner. You can fly from Amsterdam to London in 3.5 hours. Alternatively, you can take a train; or do a combination of flight and train. The time zone difference moving from Central European Time (CET) to Greenwich Mean Time (GMT) is minus 1 hour. Expect a daytime high around 13°C in November, and nighttime lows around 5°C. Cap off your sightseeing on the 12th (Tue) early enough to catch the train to Paris. 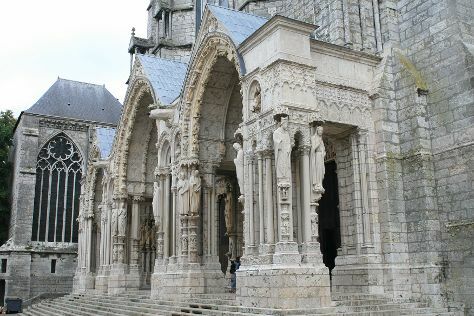 Step off the beaten path and head to Chartres Cathedral and Rue du Gros-Horloge. You'll find plenty of places to visit near Paris: Palace of Versailles (in Versailles) and Cathedrale Notre-Dame de Rouen (in Rouen). Next up on the itinerary: admire all the interesting features of Eiffel Tower, explore the world behind art at Louvre Museum, walk around Luxembourg Gardens, and admire the striking features of Sainte-Chapelle. To see photos, more things to do, and tourist information, use the Paris online attractions planner . Take a train from London to Paris in 2.5 hours. Alternatively, you can fly; or drive. The time zone difference when traveling from London to Paris is 1 hour. In November, plan for daily highs up to 12°C, and evening lows to 6°C. Finish your sightseeing early on the 17th (Sun) to allow enough time to travel to Lisbon. You'll discover tucked-away gems like Obidos Village and Cabo da Roca. Explore the numerous day-trip ideas around Lisbon: Sintra (Sintra National Palace, Castelo dos Mouros, & more). There's still lots to do: wander the streets of Belém Tower, contemplate the long history of Jeronimos Monastery, take in the views from Ponte 25 de Abril, and step into the grandiose world of Castelo de S. Jorge. For traveler tips, photos, reviews, and tourist information, go to the Lisbon holiday planner. Traveling by flight from Paris to Lisbon takes 5.5 hours. Alternatively, you can do a combination of train and flight; or drive. The time zone difference moving from Central European Time to Western European Time is minus 1 hour. Traveling from Paris in November, expect Lisbon to be somewhat warmer, temps between 21°C and 11°C. Wrap up your sightseeing by early afternoon on the 21st (Thu) to allow time for travel back home.